On July 1, we commemorate the the 117th anniversary of the birth of Thomas A. Dorsey, known in different phases of his career as “Georgia Tom”, and as the “father of gospel music.” In his long life, he was a prolific songwriter and recording artist of both religious and secular songs. Thomas Andrew Dorsey was born July 1, 1899 in Villa Rica, Georgia, the son of a preacher and a piano teacher. He began playing piano as a young man, and relocated to Chicago in 1916, where he was educated in music at the Chicago School of Composition and Arranging. He began working for Paramount Records as an agent and accompanist, and made his name in the blues world as “Georgia Tom.” During his time at Paramount, he worked with Ma Rainey and the Pace Jubilee Singers. In 1921, he heard W.M. Nix sing at the National Baptist Convention, and by the end of the 1920s, Dorsey had begun his life’s work as a composer of gospel songs, though he continued to play blues primarily at that time. In 1928, he teamed up with guitarist Hudson Whittaker, better known as Tampa Red, and made a hit with “It’s Tight Like That”. Following that success, he and Tampa Red became the first of many combinations of musicians to record as the “Hokum Boys,” making music in a similar vein as “Tight Like That”, and the duo remained popular into the early 1930s. After the hokum craze ended in the 1930s, Dorsey primarily worked writing sacred songs, and worked as a musical director at several churches. By the end of his life, his blues work was largely forgotten, and he was renowned for his sacred songs as the “father of gospel music.” After a long career, Dorsey died in Chicago in 1993, at the age of 93. There are a number of different versions of the hokum blues classic “It’s Tight Like That” that will pop up here at some point. We last heard it played by Zack Whyte’s Chocolate Beau Brummels, now here’s original recording, done on in 1928 by Tampa Red and Georgia Tom, the original Hokum Boys. This record set off a craze for so called hokum songs, that is mostly peppy songs with humorously raunchy lyrics and often very thinly veiled innuendo, which reigned in popularity over more serious blues songs for a period in the late 1920s and early 1930s. Vocalion 1216 was recorded in Chicago on two separate dates, October 16, and November 6, 1928. It features the guitar of Hudson Whittaker: “Tampa Red”, and the piano of Thomas A. Dorsey: “Georgia Tom”, with both singing the vocals. Recorded on the latter date, “It’s Tight Like That” was one of the biggest blues hits of the 1920s, and remains a hokum blues staple. The label rather humorously (at least I think so) lists the composer credits for Hudson Whittaker and Thomas A. Dorsey as “Tampa – Dorsey”, some later issues corrected this error. 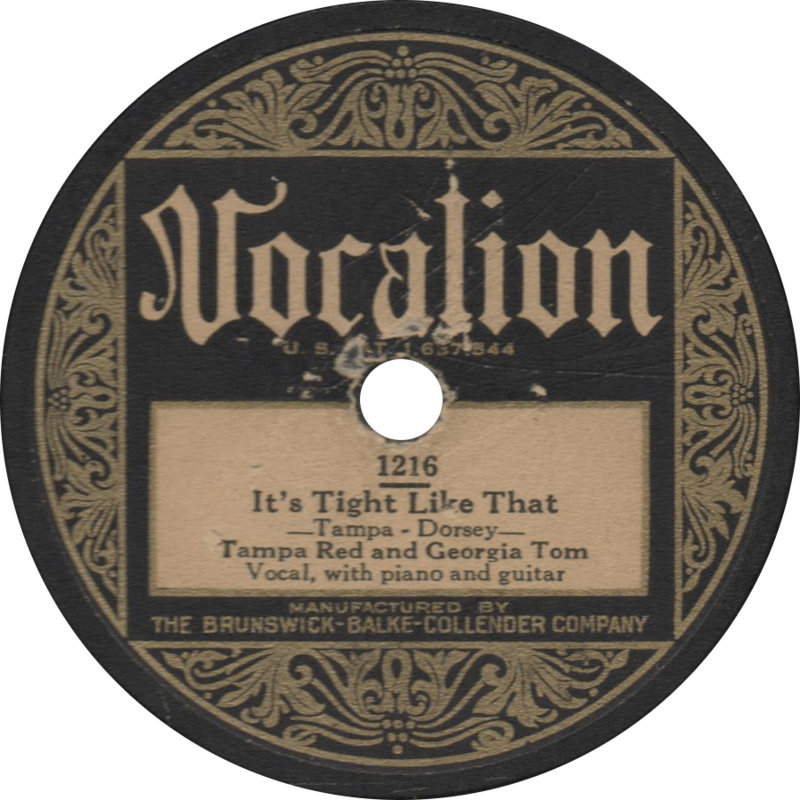 It’s Tight Like That, recorded November 6, 1928 by Tampa Red and Georgia Tom. Next, Georgia Tom sings solo, accompanied by Tampa Red on guitar on “Grievin’ Me Blues”, one of those songs that, even though a little on the humorous side, I feel just emanates the essence of blues music. This one was recorded on the earlier date. Grievin’ Me Blues, recorded October 16, 1928 by Georgia Tom. Updated with improved audio on May 23, 2017. This entry was posted in Records and tagged 1920s, 1928, Blues, Chicago, Georgia Tom Dorsey, Hokum, Race Record, Tampa Red, Vocalion by R. Connor Montgomery. Bookmark the permalink.